2001: A Space Odyssey #3 page 22 (1976). 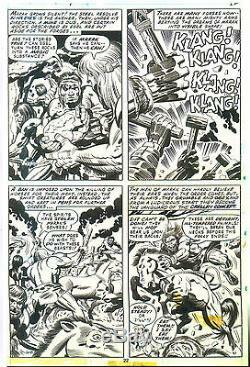 Script:Jack Kirby , Pencils:Jack Kirby , Inks:Mike Royer. Synopsis: Egel is captured by Marak and his band. The Monolith shows Marak of Queen Jalessa, and Egel builds him weapons so he can capture her. This Original Art page is Hand Drawn and done in Pencil and Ink. There are Glue Stains on this page otherwise in Great condition. 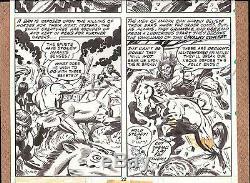 The item "Jack Kirby Bronze Age 1976" is in sale since Thursday, May 28, 2015. This item is in the category "Collectibles\Comics\Original Comic Art\Other Original Comic Art".